A friend of mine got to do the Strivectin challenge for 8 weeks. Let’s see how it went down! The following review is entirely written by her. From the Strivectin Photo-White range. Light weight and semi transparent. Melts into the skin immediately, leaving an extraordinary velvety finish. No medicinal smell. Surprisingly light and pleasant. Allows applying foundation and makeup immediately. Test on Gatsby blotting paper for an hour. No oiliness found after an hour leaving the blotting paper unchanged. Suitable for all skin type including oily and troubled skin. After 2 weeks – Skin looked smoother, more resilient. After 4 weeks – Reduced redness and improved brightness of skintone. After 8 weeks – Visible radiance, evenness of skintone. Reduced blemishes and red spots. Created smoothness and tightened pores. 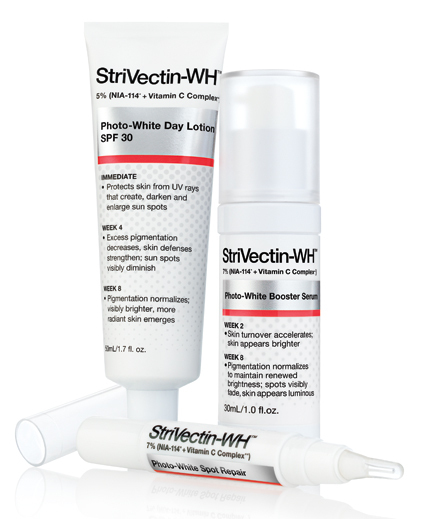 Effectiveness – Strivectin Photo White serum really is a product for all types of people, skin and ages. I am 26-year old with not many visible spots but since my skin is combination oily type I have redness from breakouts. The product definitely helped to reduce redness and really created visible smoothness. Speed of Results – I found results within the first 5-7 days, especially on damaged area around my nose. After 4 weeks I could see redness minimizing and evening out skintone. Value – I think Strivectin is very much a value product, especially as it compares to the high luxury skin care products which could cost up to three times as much. Check out the Strivectin virtual Photo-White results tool here to see how the product works on other women. Guest Post: Strivectin Challenge was last modified: April 4th, 2012 by Roxanne C.